Indoor wooden beams are typically intended to support the roof of a home. They can extend from the floor to the ceiling as a column, or as rafters along the ceiling. Like all wooden surfaces, the beams are susceptible to regular wear. This includes a gradual loss in color and density, or even cracking over time. To prevent these natural occurrences, treat the wood with a stain and varnish to preserve and protect it. Protect your eyes with safety goggles and wear a dust mask before working on a beam overhead. Sand the wood with a 100-grit sanding sponge until it appears uniformly dull. This prepares the surface for staining while eliminating dirt, blemishes and other surface imperfections. Dust the beam to remove the grit that resulted from sanding. Wipe it down with a tack cloth to clean the remainder of the sawdust. Stir a can of wood stain with a stirring stick to thoroughly mix all of the contents at the bottom of the container. Saturate the wood with an even coat using a natural-bristle brush or paint roller to even out the wood's natural color. Quickly wipe away the excess product before it dries. Brush a single coat of sanding sealer over the stain once it has dried overnight. Use long, back-and-forth strokes for even coverage. Once the coat is dry to the touch, smooth it thoroughly with a 280-grit sanding sponge. 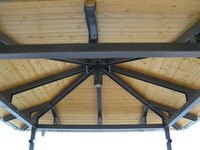 Seal and protect the beam's reconditioned finish using a polyurethane wood varnish. Apply the product with a painter's rag or foam applicator brush. Allow it to cure overnight, then sand the coat with the 280-grit sponge. Repeat the same procedure for at least one to two more coats of varnish to seal the moisture in the wood. Leave the top coat unsanded.